The school has recently introduced a new service - ‘School Gateway’. This means that the school will be able to communicate with parents more quickly and cost effectively via e-mail, text and a smartphone app. 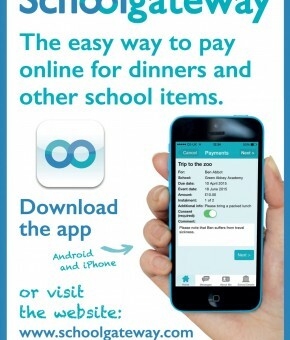 With 'School Gateway' parents will be able to make school payments on-line or via the ‘School Gateway’ app. This will be quicker and easier for parents, safer for children and more efficient for the school. top up their daughter’s lunch card at any time and her balance will be updated straight away. They will also be able to see what their daughter has eaten that day and the balance on her card. make payments for school trips and music lessons. To get e-mails or make payments you need to first register with ‘School Gateway’ – it is really quick and easy if the mobile and e-mail address you register with are the ones that are on school records. If you have recently changed your e-mail address or mobile telephone number, please let the school office know so that we can update our records. 2. When you visit the ‘School Gateway’ website for the first time, please select ‘New User’ and enter your e-mail address and mobile telephone number you have registered with the school. 3. The system will send a PIN code to your phone. Please enter this PIN code and your account will be activated for you. Once you have registered with ‘School Gateway’, please set up an Instant Bank Transfer on-line when you go to check out your first payment. You enter your bank details once and this enables you to make payments very quickly (and the school pays less bank charges than if you make a payment by card). You will only be charged when you choose to make a payment. Please note the Instant Bank Transfer will be called a Direct Debit on your bank account, but it is not a Direct Debit. Money will only come out of your account when you make a payment. You will receive an e-mail confirming your payment which will go onto your daughter's card within 10 minutes and notification of when the payment will come out of your account (approx. 5-7 days later). It is very important you have sufficient funds in your account when the payment is taken as otherwise your daughter's card could have a negative balance if the bank transaction is declined. Alternatively, you can enter your debit card details each time you want to make a payment on-line or via the app. We have set a minimum top-up of £10. This is to save the school money, as we pay bank charges on each transaction, whatever the value. 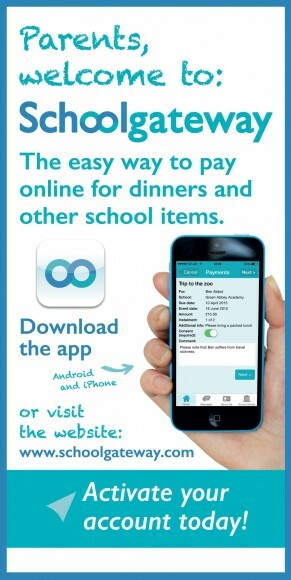 The advantages of downloading the ‘School Gateway’ app are that it is very easy to make payments via the app and parents receive all school information in one place – e-mail, text and payment information. The school can send parents app messages for free and parents can also message the school back for free. As soon as you have got the system set-up, all of the text messages we send you will appear in the app. Don't worry - if our system detects that your app won't receive messages (eg when data/internet connection is not available) it will know to send you a text message instead. 1. Search for School Gateway in the Apple App Store/Google Play or on your phone go to www.schoolgateway.com/apple (Apple - iPhone 3GS or later, iPad, iPod Touch) or www.schoolgateway.com/android (Android - 2.3 / Gingerbread or later). 2. Install the app and if you are asked, then say yes to “Allow Push Notifications”. If you have problems joining School Gateway, it may be that the school does not have the correct e-mail and mobile number for you. If this is the case, please complete and return the form below to the school reception as soon as possible or alternatively contact the school office on 0207 288 1888.